Exterior Raised Panel Newel Post made of Western Cedar adds beauty, strength, and elegance to your porch railings. Newel Post Width Choose an option8"12"
Raised Panel Newel Post made of premium clear Cedar. Caps for the 8″ wide newel are available in Cedar or Polyurethane. Caps for the 12″ newel are available in Polyurethane only. Actual Width: 8″ or 12″. Specify length. We recommend ordering newels 4″ taller than your top rail height. For example, if you have a 36″ top rail height, you’ll want to order a 40″ newel. Square portions are 9″ tall on each end. Square portions are tall enough that rails can be connected without running into the raised panel portion in most situations. Made with floating raised panels, which helps prevent cracking due to the material expanding/contracting with the weather. Raised panel is on all four sides for a great look from any angle. An ingenious design constructed in similar fashion as a cabinet door, but with beefy corners to make for a strong newel post. The Open Center Design allows for the use of our Newel Installation Kit, which eliminates the need for trim to cover up fasteners. Or, they can be used as a decorative “sleeve” over an existing post. They can also be used as a COLUMN PEDESTAL in this way (non load bearing). PRIMING OPTION (recommended): Premium acrylic primer in flat white available as an option, which allows for immediate installation. Expect some blemishes in the primer from shipping. This is normal and will not affect the finished result when painted after installation. Western Cedar is a great outdoor use wood that has been the standard throughout the US for many decades. Usually when people say simply “cedar”, this is the wood they are referring to. It is highly resistant to decay and very beautiful, and we use only CLEAR Western Cedar so there are NO KNOTS. You simply cannot find a better grade of wood (because it doesn’t exist)! This results in very beautiful, and very stable millwork. Our Western Cedar consists of both Western Red and Incense cedars. What length (height) of newel should I use? Newels are typically 4″ taller than your top rail. Example: 36″ top rail height, order a 40″ newel. 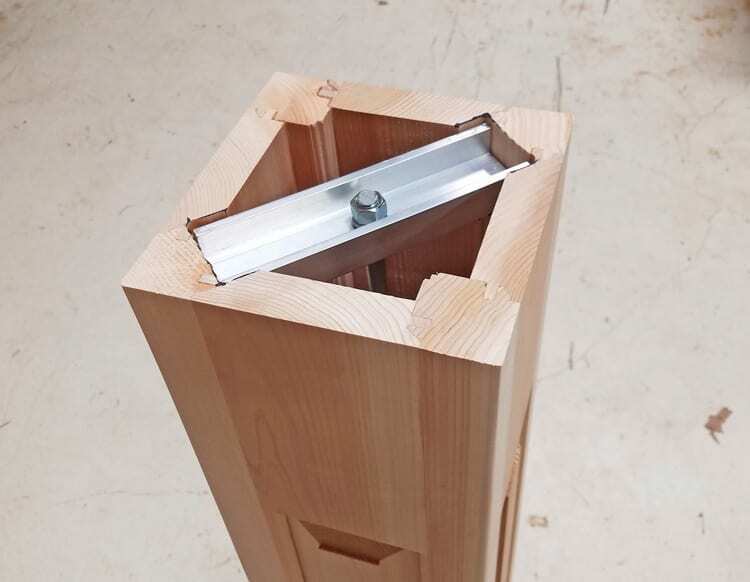 Can I attach rail to the square sides of the newel without running into the Raised Panel? Yes. The square portions are 9″ tall on top and bottom, which gives plenty of room to attach rail from any side. They work especially well with our 6″ class 3-piece and 4-piece Porch Rail Systems. I have a masonry floor. Can I use your Newel Installation Kit to mount these Newels? Yes. Our Newel Installation Kit can be used with masonry, concrete, or wood.